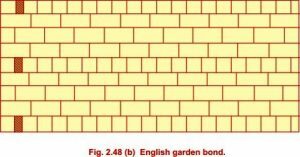 Types of bonds, Stretcher bond, Header bond, English bond, main features of English bond,Arrangement of Bricks in English Bond, Flemish bond, Dutch bond, Garden wall bond, Raking bond,Two varieties of raking bond viz., Diagonal bond and Herring bone bond, Facing bond. 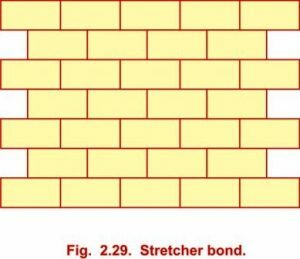 In this type of Bond all the bricks are laid as stretchers, that is length wise, as shown in Fig. 2.29. This bond is used-in half brick thick walls. In this bond, all the bricks are laid all headers. The elevation of the wall laid in header bond is shown in Fig. 2.30. This bond is used for curved surfaces in work such as well lining or well foundation etc. This is the most common and popular bond and is used in most of the structures. The English bond consists of alternate layers of headers and stretchers. That is to say, one layer will be of stretchers and the other layer of headers. The alternate courses are of headers and stretchers. Each alternate header is centrally supported over a stret­cher. 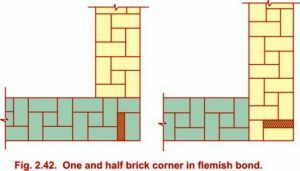 If the thickness of a wall is an uneven or odd number of half bricks, there will be best stretchers on the face and headers on the back, similarly headers on the face and stretchers on the back of the wall in every course. If the thickness of the wall is an even number of half bricks, there will be stretchers on the face and stretchers on the back ; similarly, headers on the face and headers on the back every course of the wall. 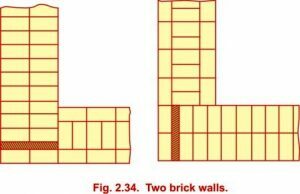 The walls having a thickness of two bricks or more will have stretchers or headers on the face and back of the wall whereas the interior will be filled with header only. Two, one brick thick walls meeting at right angles at the corner. Fig. 2.32. 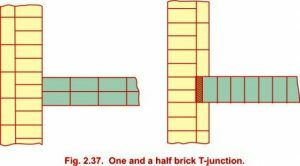 Two walls, one brick thick and one and a half brick thick, meeting at right angles at the centre (T-junction). Fig. 2.37. 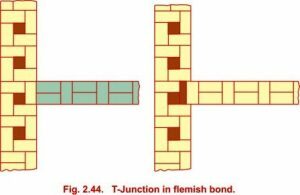 Two brick and one and a half brick T-junction, (e) Two, one and a half brick thick walls crossing each other at right angles. Fig. 2.39. In this type of bond, each course consists of header and structures alternately arranged. 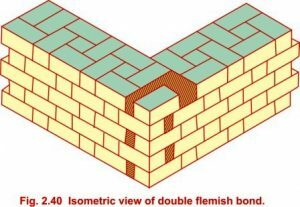 The Flemish bond as of two types, viz, Single Flemish and Double Flemish, The single Flemish bond consists of Flemish bond on the face of the wall and English bond on the back of the wall. 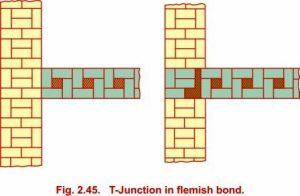 Whereas the double Flemish bond consists of Flemish bond on the face as well as on the back of the wall. 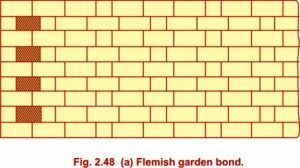 Flemish bond admits the use of greater number of brick bats and hence it is economical. 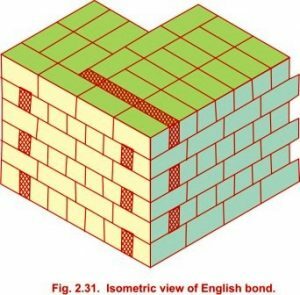 But English bond is stronger than Flemish bond. 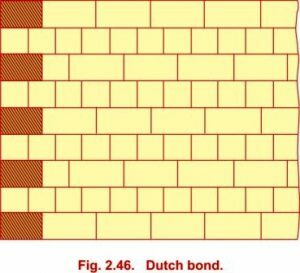 It is also claimed that Flemish bond is better in appearance than the English bond. 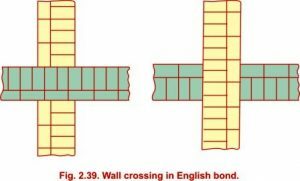 It is a modification over the English bond and consists of alternate courses of headers and stretchers, except that every stretcher course starts with a three-quarter brick and in every alternate stretcher course in header is placed after the three quarter brick as shown in Fig. 2.46. The walls which are more than two-brick thick will become weaker in longitudinal strength, as the headers being used in the interior of the wall to increase the transverse strength. This defect is removed by using raking bond (rake means inclination). In this bond the bricks are laid at some inclination to the face of the wall. 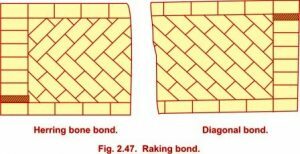 There are two varieties of raking bond, Diagonal bond and Herring bone bond. This type of bond is employed in walls, which are 2 to 4 thick. 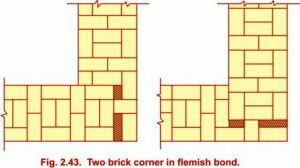 In this bond, the face bricks are first laid and then the bricks are laid diagonally. The inclination of the bricks should be so adjusted that the bricks may be filled without cut ting. This bond is best suited for walls which are at least 4 bricks thick. In this case, the bricks are laid at an angle of 45° in both directions, commencing from the center line as shown in Fig. 2.47. Raking bond pattern of laying bricks is also sometimes used for laying bricks on the floors. This bond is used when the bricks for the face work are costlier than the other bricks and as such the number of face bricks is economized by using more stretchers. 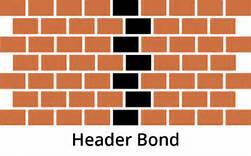 This bond is also used when the thickness of the face and back bricks is different. There are a number of stretcher courses followed by header courses. The thick­ness of stretcher courses should be multiple of the thick­ness of thinner bricks. 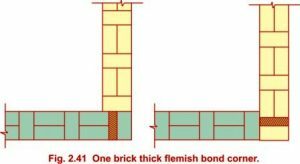 For example, the thickness of face bricks is 5 cm and that of back bricks in 3 cm. Then after three courses of face bricks and five courses of back bricks the height of face and back bricks will become the same. Now at this height header course should be provided.